Flexi work to ease rush-hour congestion? AN INTER-MINISTERIAL work group will be set up to study ways to introduce flexible work arrangements, including staggered start times for workers, to ease congestion on the public transport system. It will be chaired by Minister of State (Transport) Josephine Teo and Minister of State (Manpower) Tan Chuan-Jin. Announcing this yesterday, Transport Minister Lui Tuck Yew said: 'More can be done to better distribute the loading on our public transport system during peak travel periods. The work group will engage stakeholders in public and private sectors. There are already two schemes to encourage more commuters to travel during off-peak periods. 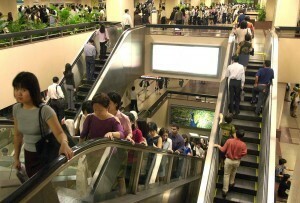 A six-month trial by the National University of Singapore and Stanford University, with about 7,000 participants, gives those who signed up a chance to win up to $100 if they travel on trains during morning off-peak periods. The researchers plan to expand it to 20,000 commuters, to determine if such incentives can entice commuters to switch to off-peak travel. Rewards of more than $13,000 have been given to almost 2,000 commuters. The study costs about $400,000 and sponsors include the LTA. The other travel incentive scheme is run by SMRT, which offers a 30-cent discount for commuters who exit from nine stations within the city before 7.45am from Mondays to Saturdays. Mr Tham Chenn Munn, director of a mobility consultancy firm, welcomed these moves and also suggested car- sharing.